Ascension of the Whyte - Now Available Free! I am pleased to offer Ascension of the Whyte as a Free E-Book. Simply click the Smashwords image below to download your copy. Don't miss your chance to read the first book in this exciting fantasy series - for free! And the winner is..... Olivia Kennedy - well done Olivia, as soon as I receive your details a signed copy of Ascension of the Whyte will be winging its way to you! Don't despair - Ascension of the Whyte is available as a free ebook. Just click on the Smashwords link below to download your very own copy. My story takes place in a make-believe world that brings together legends and lore from multiple mythologies, featuring characters such as Rougarou, Witches, Dragons, Knuckers, Wizards, and even something called a Pukis. 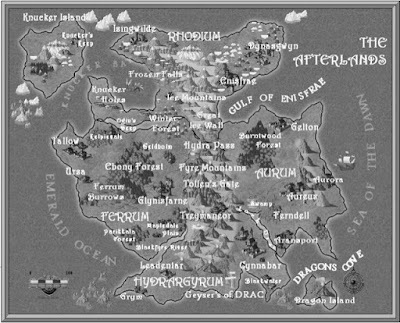 I, like every other fantasy author had to decide when, and how, to build my world. Should I construct a whole complex world complete in every tiny detail before I even started to write a single word of prose, or should I just let the world evolve around my characters as the story unfolded? Both of these options seemed to be unworkable to me. Being rather impatient by nature I knew that detailed planning if it did not cause me to lose the will to live, would certainly deter me from ever writing the book. Hours of meticulous world building would have turned the whole process into a chore, and writing should never feel like a chore. On the other hand, I knew that ploughing ahead with the story without thinking through the major concepts of my world would undoubtedly be a risky thing to do. A world built up randomly, like a patchwork quilt without a pattern, could more than likely result in the pieces not quite meeting up at the centre. Eventually, I decided to take the middle path and to build my world around the characters, using a stable scaffold built on known scientific facts and mainly European mythology, to begin with and then adding more detail as the story unfolded. As a psychologist I am always studying people and how the world around us influences our behaviour, so it seemed natural to me to just reverse the process and let the characters tell me what their world is all about. After all, they had been rattling about in my head for weeks before I even started to think about their surroundings in any detail, and I was already intimately acquainted with the many ways in which each cast differed from the other. The Bloods, for example, were a seemingly emotionally cold race of people who made decisions using pure logic. Their eyes were slanted, their faces pale and grey, and their hair a fiery shade of red. It seemed obvious to me that their land just had to be inhospitable, fiery, and hostile, a land where life was always hard and emotions had to be kept in check. An image swam into my mind whenever I thought of the Bloods. It was the image of a barren volcanic landscape, rich in heavy metals and ores, with craggy mountains breaking the skyline, their jagged, rocky slopes a honeycomb of tunnels, caves, and mine shafts. The Blood people and their land just seemed to fit together, like pigs and muck, and so the land Hydrargyrum was born. I knew that I wanted the theme of racism and racial inequality to feature in my book, so I decided that each cast would be named by their differences in hair colour. Just as in our world, we tend to categorise races by their skin colour (Black, White, Caucasian, etc.) So the races of the Afterlands were labelled and judged by their hair colour, as Golds (blondes), Muds (chestnut haired), Bloods (red heads), and Whytes (silver haired). I found that quite unintentionally, these names seemed to suggest certain qualities for each race, for example, I quickly decided that the Golds would have to be beautiful, intelligent, wealthy, golden skinned, golden haired people if they were to live up to their ‘golden’ name. Then very rapidly the whole world building bit seemed to take on a life of its own. In keeping with the ‘Gold’ theme, and knowing that it was common to name lands based on their geographical properties such as Argentina (Silvery Land), it felt logical to name lands after the metals and ores that were found most abundantly in each region. So the land of the Golds became Aurum (the Latin word for gold). The bonus was that it underlined the qualities of its people, who were thought to be untarnished, valuable, wealthy and beautiful. Similarly the fauna and flora rich land of Ferrum (Latin for iron) naturally suggested people who were rough, robust and workmanlike, the farmers, hunters, and peasants of the Afterlands. Hydrargyrum being the Greek name for Mercury, which is a relatively stable, toxic metal that is liquid at low temperatures, fitted well as the land of the Bloods with their cold, un-reactive, and logical personalities. Once I had this scaffold to work on, then crafting the features of the final, and arguably most important northern land, became simply a matter researching the properties of metals to locate one that was silver white in colour, rare and valuable. Rhodium fitted the bill perfectly. Once I discovered that Rhodium was a scarce and precious ‘noble metal’ named from a Greek word meaning ‘Rose,' then not only did I have the name of my final Afterland, but also I had the name of the heroine of my book. The final important discovery I made about world building was that if you did not want your story to get lost in inconsistencies, then you needed a map. Drawing my map turned the descriptions of the journeys that the characters travelled into really accurate and plausible depictions of each expedition and gave my writing an element of confidence that added to this realism. It was as if I was describing a real journey to an actual place and it was real to me - because I had a map! World building for me turned out to be around eighty percent inspiration and twenty percent perspiration. I think that you need a good measure of both of these for it to be successful. How wonderful is it, though, to be able to close your eyes and travel to a land where the only boundaries are those of your imagination? My dreams are never dull! To find out more about The Afterland Chronicles Series visit Karen Wrighton's official website.